Now you can deliver dedicated server instantly. Using our Server Manager you can drag & drop your servers into the related product. With the use of configurable options you can let your clients choose about options like RAM, HDD size and operating system. At our server manager you can exactly define which conditions must be meet to deliver this server. In the server manager you can exclude certain servers from automatic provisioning (eg if the server is damaged). You can also assign an ACL group with just a few clicks. This is especially useful if you are offering managed servers where the customer should have fewer rights. VPS can be automatically created. 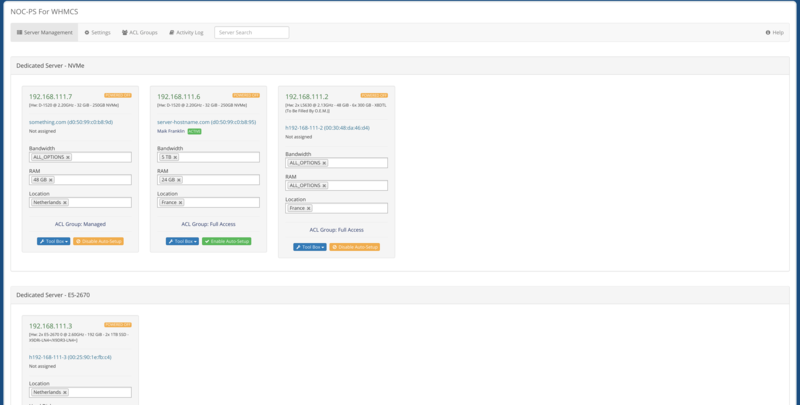 With our “IP Manager” you have full control which IPs get assigned to new orders. The IP Manager also allows you to reserve IPs, make comments to IPs for better tracking and see which IPs are currently assigned. If you have several NOC-PS installations, you can assign in the ip manager, which host system should use which ip ranges. The resources of the package can be defined as usual in the product settings of WHMCS. If you bill for bandwidth, you can offer custom bandwidth packages which overwrites the default bandwidth limit. When ordering, clients can select a operating system which will be automatically installed. Complete support of whmcs configurable options. Thus dedicated servers can be delivered based on the chosen options.